Pumpkins make a strong comeback when it comes to Fall. This autumn squash is very healthy. Just be mindful pumpkin can quickly become a sugary, calorie rich dessert. Pumpkin contains well over your daily requirement of vitamin A (700% DV in 1 cup). Vitamin A is involved with immune function, vision, reproduction, and cellular communication. Source. It’s full of fiber, pumpkin puree contains 7 grams of fiber in 1 cup. Pumpkin contains high levels of vitamin C which can help your immune system. It also contains more potassium than a banana. Pureed pumpkins contain lutein and zeaxanthin which can help your vision health. Pumpkin is also a good source of beta carotine which can help lower chances of cardiovascular disease. 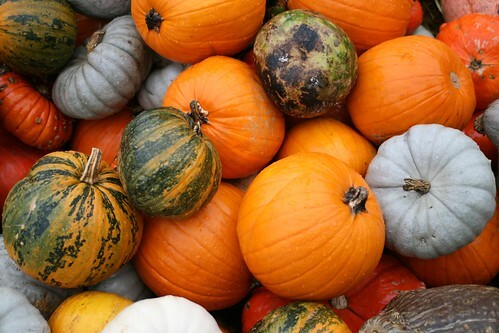 Enjoy pumpkins in breads, pies, and mix a bit with cinnamon and a bit of sugar in oatmeal, or add it to a smoothie.